I’ve consumed a lot of unusual foods, drinks, and supplements on my journey to find health answers. From the green smoothies, to the fermented fish livers, to the marine phytoplankton, I’ve tried some interesting things over the years. Of all the strange things I’ve tasted, this recipe has to be close to the top of the list of unusual flavors. Our family has been drinking kombucha for years, and about a year ago, I tried brewing kombucha with coffee at the suggestion of a friend. 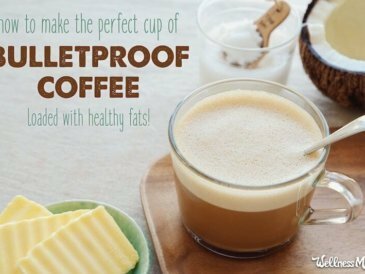 It definitely worked, and the result was a probiotic coffee that was very much an acquired taste. I did find a few tricks to make it taste better, like doing a second ferment with simple syrup and flavored stevia, creating an effervescent and slightly tangy chilled coffee drink. 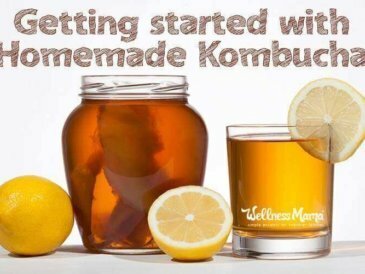 If you’ve never brewed regular kombucha before, I would suggest starting with that to learn the brewing process with its natural ingredients (here is a tutorial). Since coffee is naturally acidic, I found that less additional starter liquid is needed. 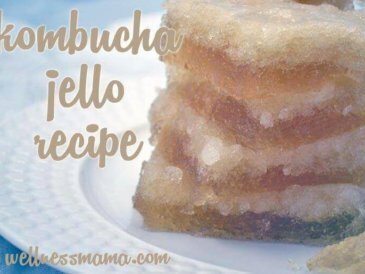 Use an extra baby SCOBY and not the SCOBY you use for brewing regular kombucha, as once a SCOBY is used for coffee, it should not be used for tea kombucha again. 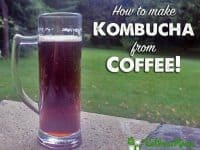 I found that coffee komucha brews more quickly, so test it often and be ready to start a second ferment or put in the refrigerator to stop fermentation after a few days. The second ferment is necessary for the flavor of coffee kombucha. Without it, the finished result will be very tangy and bitter. 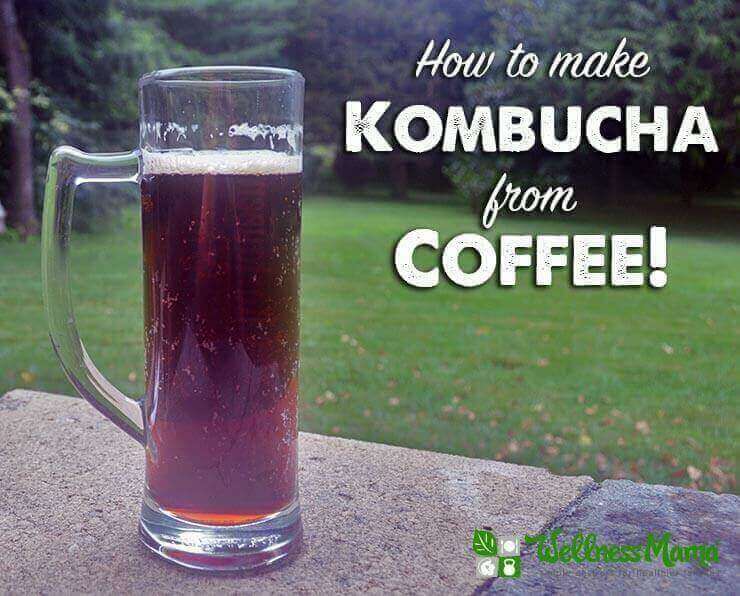 Make kombucha from coffee and avoid the fluoride in tea. 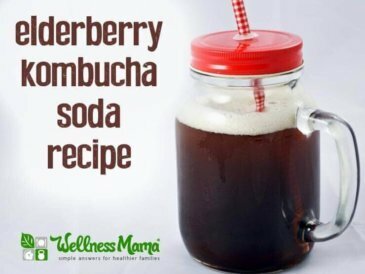 This energy boosting tangy drink is easy and delicious. Add the sugar to the coffee while it is still hot and stir to dissolve. Let the coffee cool to room temperature. Pour the brewed coffee into a gallon size glass jar. Add the SCOBY and the 1 Tablespoon of brewed kombucha to the jar. Cover with cheesecloth or a coffee filter and a rubber band. Let sit at room temperature for 3-5 days or until it reaches desired flavor. It will still be slightly tangy and bitter at this point. Remove the SCOBY and use to make a new batch. 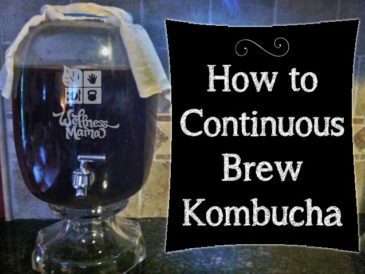 Pour the brewed coffee kombucha into quart size mason jars or bottles for the second ferment. Divide the simple syrup and stevia evenly between the jars or bottles. Place airtight lids on the glass jars and leave at room temperature for an additional 24-48 hours for a second ferment. This will add carbonation and a little more sweetness to the brew. Refrigerate and serve cold as desired. I recommend serving over ice and adding coconut milk and additional flavored stevia to taste if desired. 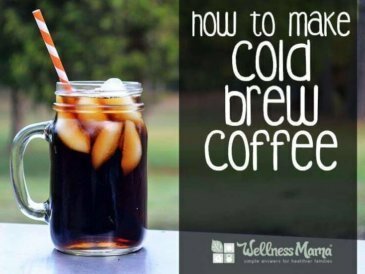 If you want, you can make half a batch with only 1.5 quarts of coffee and ½ cup sugar. What is the most unusual thing you’ve ever tried in the name of health?